Home » Facts » Plant Facts » Christmas Trees production in the U.S. In the United States, the National Christmas Tree Association (NCTA) promotes the environmental benefits of live Christmas trees over the competing artificial alternative. The NCTA stated that every acre of Christmas trees in production produced the daily oxygen requirement for 18 people; with 500,000 acres (200,000 ha) in production in the U.S. alone, that amounts to oxygen for 9 million people per day. The NCTA also stated that the farms help to stabilize the soil, protect water supplies and provide wildlife habitat. 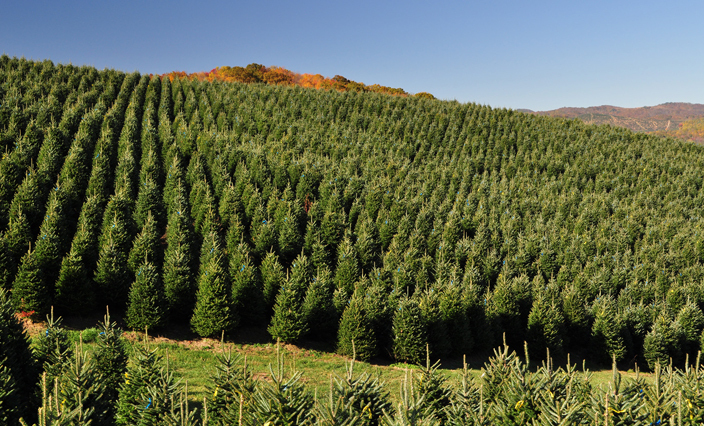 In addition, the industry points to the reduction of carbon dioxide through Christmas tree farming. An independent Life Cycle Assessment (LCA) study, conducted by a firm of experts in sustainable development, states that a natural tree will generate 3.1 kg of greenhouse gases whereas the artificial tree will produce 8.1 kg per year. In the United States, Douglas-fir, Scots Pine and Fraser Fir all sell well. In the southern United States, Virginia Pine is a popular Christmas tree species. In the United States, the U.S. Forest Service and the Bureau of Land Management offer permits for individual tree cutting on government land, mostly within the National Forest system.